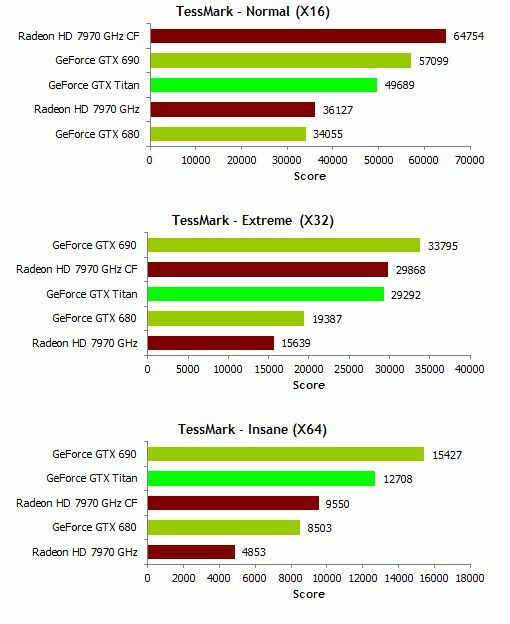 According to this screenshot of TessMark scores (from AnandTech), the GeForce GTX Titan is around 50% faster than the GTX 680 in tessellation. Unsurprisingly, Titan is well ahead of anything else NVIDIA produces. At 49% faster it’s just a bit over the 46% theoretical performance improvement we would expect from the increased number of Polymorph Engines the extra 6 SMXes bring. 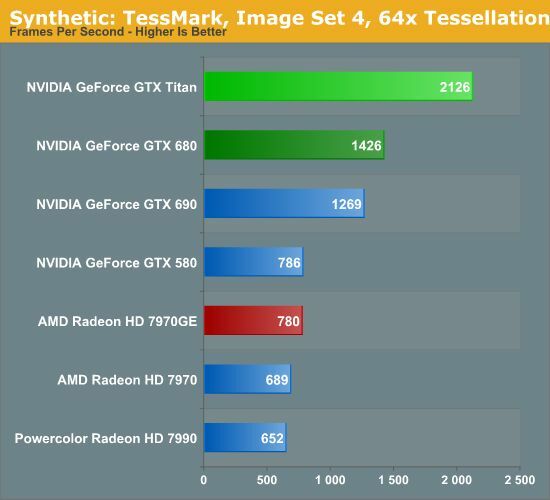 Interestingly, as fast as GTX 580’s tessellation performance was, these results would indicate that Titan offers more than a generational jump in tessellation performance, nearly tripling GTX 580’s tessellation performance. Though at this time it’s not at all clear over just what such tessellation performance is good for, as we seem to be reaching increasingly ridiculous levels. The last couple generations of Nvidia GPU architectures have been able to sustain much higher levels of polygon rasterization and throughput than the competing Radeons. The big Kepler continues that tradition, easily leading the GeForce GTX 680, even though its peak theoretical rasterization rate isn’t much higher. Most likely, the GK110’s larger L2 cache and higher memory bandwidth should be credited for that outcome. Titan: 2126 fps; GTX 680: 1426 fps – bad due to mistake but yes 212,6 fps; 142,6 fps, respectivately. Thanks, I didn’t paid attention to the unity used in scores, but with TessMark, the scores are not in FPS but in points then the GTX Titan scored 2126 points. ooh. Not 2126 points on Titan because my GTX 480-266.58WHQL-HQ got 4023 points (AVG 67 fps; min 63 and max 75) at 1680×1050+insane+set 4 running TessMark 0.3.0 on XP x86 SP3 and old AMD X6 1055T. I think you’re right, the scores are in FPS and we should read 212.6 FPS for the Titan. 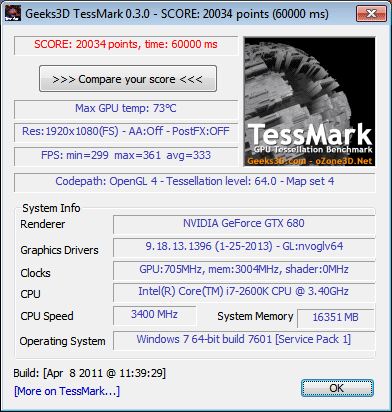 I just tested TessMark on a GTX 660 (1920×1080 fullscreen + tess 64 + map set 4) and my card scored 7233 points (120 FPS avg). GTX 690 – 1268 fps – WHY?! GTX 680 – 1426 fps – WTF?! @G.T.X: I think only one GPU has been used in the GTX 690 (always the old story with OpenGL apps that don’t have a f*ck**g profil in NV’s drivers).